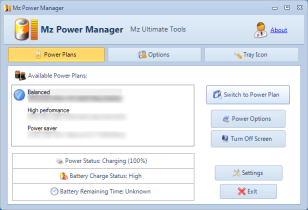 Mz Power Manager is a smart power management application, for configuring Windows power settings. It can manual/automatic switch Windows power plans, display all available power plans in system tray for a faster switching and display battery information. It also comes with some extra useful features.